Awesome case of HeroClix mini-figures! The Hobbit: An Unexpected Journey gets the HeroClix treatment. Collect all 30 different figures! Explore Middle-earth and enjoy a grand adventure with Thorin Oakenshield and Company! 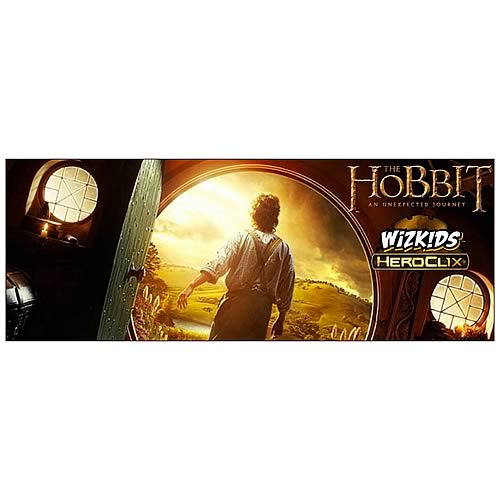 The Hobbit: An Unexpected Journey comes alive on your tabletop with this excellent line of HeroClix mini-figures based on the blockbuster film. With more than 30 figures to add to your HeroClix collection, this HeroClix expansion offers a sneak-peek into the majesty and mystery of Middle-earth as seen in The Hobbit: An Unexpected Journey feature film. Special powers and Epic Abilities based off of the movie will enhance your HeroClix experience as Bilbo Baggins, Gandalf the Grey, and Thorin Oakenshield are joined by both friend and foe from the classic storyline from J.R.R. Tolkein's The Hobbit book. This line of HeroClix is one that fans of The Hobbit and The Lord of the Rings won't want to miss out on! This case contains 48 individually packaged HeroClix mini-figures. Note: Figures come in blind-box packaging. We cannot take orders on specific characters, nor can we take any returns on opened packages at this time. You may receive duplicate figures. Ages 14 and older.